Seven Springs Mountain Resort, Pennsylvania. One-hour rides take place after the mountain closes for the night in a specially designed snowcat that features a cabin on the back. Something like a small bus, the cabin holds up to 10 passengers. "Guests in the lodge see the terrain being groomed every night, and we have had many people ask if it would ever be possible for them to go for a ride," states Robert Duppstadt, spokesperson for Seven Springs. "Seven Springs has decided to offer this awesome experience to guests," he adds. Available 11 p.m., 12 a.m. and 1 a.m. $20/per person. Reservations are required and may be made by calling 800-452-2223, extension 3. Snowmass and Aspen Mountain, Colorado. Here the rides are offered free, but advanced reservations are a must. “Ride with the groomers in the big rigs,” is how they advertise it. 800-525-6200 for info or reservations. Winter Park, Colorado. 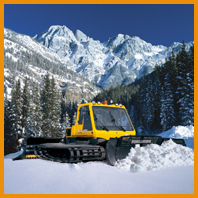 Winter Park’s Scenic Snowcat Tours are two-hour affairs that explore the resort’s hills in a heated, 12-passenger snowcat. Departures daily at 10:00 a.m., 12:00 p.m. and 2:00 p.m. This loop tour travels across beginner, intermediate, and expert trails, making several stops along the way for photos. Price: $44; children 3 or under free if they can sit on an adult's lap. Dress for the winter weather with shoes suitable for being on the snow. Reservations/information: 800-729-7907. Keystone, Colorado. Grab a few friends and family and take a snowcat ride through the back mountains of Keystone Resort! Breathtaking views of the Continental Divide, Ten Mile Range and the Gore Range are just a part of the fun. Tickets are available by calling 303-496-4FUN. Reservations are recommended, walk-ins will be accepted if seats are available. Cats depart at 4pm. $25 Adult, $15 Child. Keystone.snow.com . Beaver Creek, Colorado.Combine a snowcat ride with a dining adventure at Beanos, Beaver Creek's answer to a high altitude epicurean experience. They even have a kid's menu! Beanos Dining Adventure .